I just love these types of stories, acclaimed physicians (usually psychiatrist) deconstruct the psyche of a famous movie villain. Well Mr. Vader, its your time on the couch and several French Psychiatrist have decided that you have Borderline Personality. Borderline personality disorder (BPD) is a personality disorder defined in DSM-IV and described as a prolonged disturbance of personality function in a person (generally over the age of eighteen years, although it is also found in adolescents), characterized by depth and variability of moods. The disorder typically involves unusual levels of instability in mood; black and white thinking, or splitting; chaotic and unstable interpersonal relationships, self-image, identity, and behavior; as well as a disturbance in the individual's sense of self. In extreme cases, this disturbance in the sense of self can lead to periods of dissociation. So actually, the final scenes of Episode III show Mr. Vader/Skywalker's variability of moods and splitting between black and white when he attacks Padme for assaulting his beliefs in the motivation of the Jedi order all the while he turned his back on them in order to provide Padme a solution to her pending death (which ironically was due to Mr. Vader's direct actions). Anyway, the writer over at screenrant makes a good case. If the French could figure it out, then why couldn't Master Yoda? 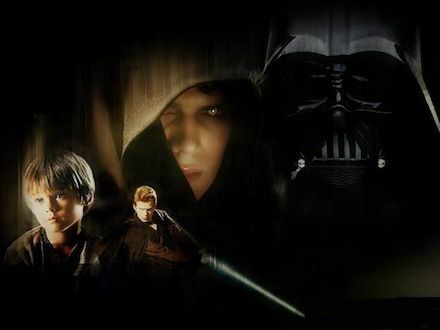 Furthermore, I now am giving my son lessons in psychiatry since after all- teenage Anakin is his favorite character (at least its not JarJar- anymore! ).